For years, many schools across the U.S. have offered qualified students the ability to take advanced-level courses apart from many of their fellow students in a practice known as tracking. New data released in the 2016 Brown Center Report on American Education shed light on tracking, who it applies to, and its implications for student achievement and equity in American schools. The 2016 Brown Center Report on American Education is the fifteenth installment in the long-running series authored by Tom Loveless. One of the three studies in this year’s report, “Tracking and Advanced Placement,” investigates whether there is an association between offering accelerated math courses to students in eighth grade and performance on Advanced Placement (AP) exams four years later, when those students are seniors in high school. It’s an important question with ramifications for academic achievement and equity in American schools. The main findings of the tracking/AP study are summarized below. Tracking is the practice of grouping students into different classes based on ability or prior achievement. Accelerated or honors courses offer above-grade-level curricula to students who are ready for it, and allow high-achieving youngsters to move at a faster pace than their peers. According to Loveless, tracking is typically introduced in middle schools, particularly in mathematics. For today’s eighth graders, the tracking question generally boils down to whether high achieving students who are ready for a formal algebra course will get one—or whether all students will take the same general math course. By examining state-level tracking data, Loveless finds that tracking eighth graders in math courses is quite popular across all fifty states. The average state in 2009 tracked about three-quarters of its math students, with Arkansas the least tracked state (50 percent) and Nevada the most tracked (97 percent). However, tracking is a controversial practice. As Loveless explains, “critics argue that tracking creates or reinforces social inequities because black, Hispanic, and socioeconomically disadvantaged students are historically underrepresented in accelerated tracks.” The resulting belief that tracking is discriminatory in nature has led different communities to view and utilize the practice in unequal measure, according to Loveless. Tracking is more prevalent in suburban middle class communities and in schools serving white and Asian students and less prevalent in urban schools and schools serving predominantly black, Hispanic, or disadvantaged populations. As a result, certain students are much more likely to be exposed to and to benefit from advanced coursework. And yet, as Loveless summarizes, recent research indicates that high-achieving disadvantaged students may benefit from tracking and, in fact, suffer losses from being enrolled in heterogeneous courses. Does tracking in middle school lead to improved outcomes in high school? States with larger percentages of tracked eighth graders produce larger percentages of high-scoring AP test takers, whereas states where tracking is less prevalent tend to have a smaller proportion of high scorers. 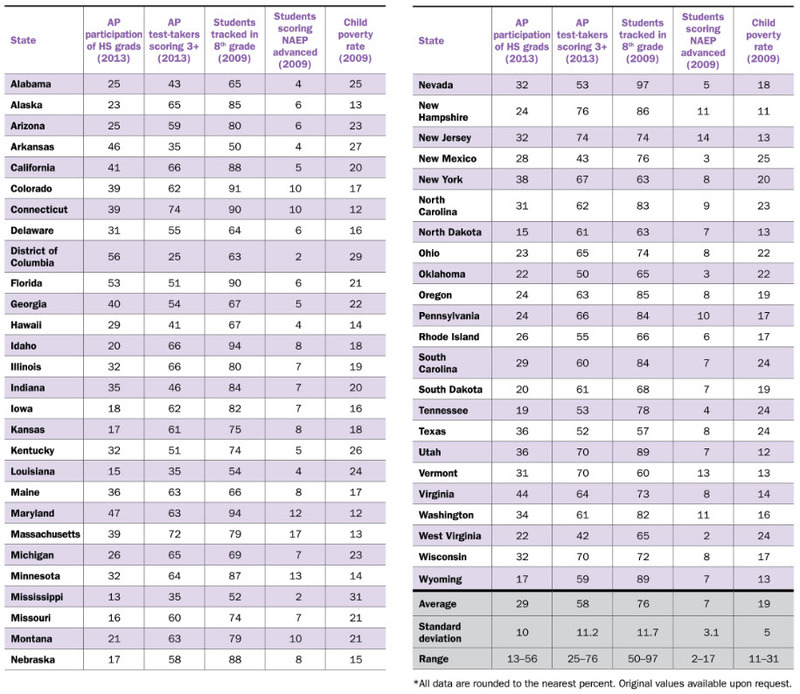 As displayed in the table below, highly tracked states with an above average share of 3+ AP scorers include: California (88 percent tracked), Colorado (91 percent), Connecticut (90 percent), Maryland (94 percent), Minnesota (87 percent), and Utah (89 percent). States with sparser eighth grade tracking and a below average proportion of high-scoring AP students include: Delaware (64 percent tracked), District of Columbia (63 percent), Louisiana (54 percent), Mississippi (52 percent), and Texas (57 percent). There is no association between tracking and AP participation (i.e. the percentage of high school seniors taking an AP exam). In other words, the increased share of high-scoring AP students is not simply due to states making sure that only higher achieving students take the exams. The heightened AP performance holds for black, Hispanic, and white subgroups. “If eighth grade tracking operates in a manner discriminatory to blacks and Hispanics, it is not apparent here,” says Loveless of this critical finding. Increasing the share of students in tracked math courses in eighth grade can lead to more high-scoring AP students. An increase of 10 percentage points in eighth grade tracking is associated with a two percentage point increase in high performing AP students. In other words, increasing the share of eighth graders in tracked courses by ten percentage points is associated with an additional 20,000 students scoring 3 or higher on AP exams nationwide. The evidence presented in Loveless’ study suggests that tracking students in eighth grade is an effective way to prepare students for academic excellence, as measured by performance on Advanced Placement exams. High scores on AP exams not only signify academic distinction, but they can also translate to college credit, allowing students to get ahead and to save on tuition costs. Read the full 2016 Brown Center Report on American Education for more.